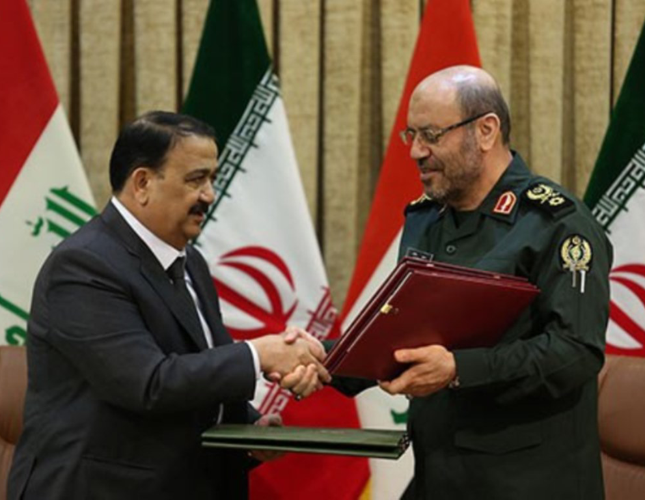 Iranian and Iraqi Defense Ministers Brigadier General Hossein Dehqan and Irfan al-Hayali signed a Memorandum of Understanding (MoU) to expand cooperation in military, defense and anti-terrorism fields, Fars News Agency (FNA) reported. The MoU which was signed in Tehran on Sunday underlines development of cooperation and exchange of experiences in areas of fight against terrorism and extremism, establishment of security at borders and mutual training, logistic, technical and military supports. After signing the agreement, General Dehqan and al-Hayali underscored broadening of defense ties between the two countries, expressing the hope that the MoU would lead to more serious, deeper and more active cooperation. In a relevant development in November, Iranian Border Guards Commander Brigadier General Qassem Rezayee and his and Iraqi counterpart General Hamid Abdullah Ibrahim in a meeting in the city of Mehran in Western Iran discussed broadening of mutual cooperation. During the meeting in the Western Iranian border city, the Iranian and Iraqi border guards commanders explored avenues for bolstering and reinvigorating of bilateral ties. Also, in April, Iranian Deputy Defense Minister Qassem Taqizadeh and al-Hayali in a meeting underlined the need for boosting mutual cooperation. During the meeting in Baghdad, Taqizadeh and al-Hayali explored avenues for bolstering and reinvigorating of bilateral ties in the defense and military fields. The senior Iranian and Iraqi defense officials emphasized strengthening defensive relations between the two countries. Taqizadeh, meantime, congratulated the Iraqi people and government on the recent victories in the fight against the ISIL terrorist group.